Introducing new technologies to a market (and thereby creating a new sub-market) adds additional complexities to the skill and practice of Product Management, especially if the new technologies are regarded as “disruptive”. I watched again a YouTube video of the original iPod launch, it was very understated and it would have been difficult from that event to predict the impact that that startling white box would have on the global music industry. In my view, Product Management is the harnessing of the creativity of technicians to create commercially successful products. Producing disruptive products is high risk and if the ideas from the technologists are too far ahead of what the market will accept then the product will fail. So the creativity of technicians needs to be tempered with market reality. Still image cameras present a good example of this. Digital technology was disruptive to the film industry, one that had been going for 100 or so years. When first launched, digital wasn’t seen as a threat to pro-cameras, because the quality of image wasn’t up to film quality, by a long margin. For the consumer, point’n’shoot cameras represented freedom from ongoing purchasing of film, delivered instant processing of pictures and the quality was good enough. Combining a digital point and shoot with a cell phone was a stroke of genius. The ability to instantly share photos by email or upload adds yet more appeal for the consumer. 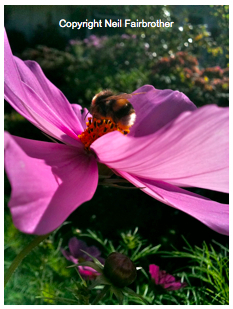 The picture on the left of a busy Autumnal bumble bee was taken with my iPhone 3GS. Famously, Kodak became a shadow of its former self; once an innovator it was caught out by this disruptive technology. Consumers loved the freedom that digital cameras presented and dropped film almost overnight. The most popular form factor for professional film cameras was the 35mm SLR, the Single Lens Reflex. This provided a through the lens (TTL) viewpoint by use of a flip-up mirror combined with a prism. Together with interchangeable lenses this form factor provided fantastic control and choice for photographers. It is not surprising therefore that this was the form factor digital adopted to address the pro market as well, with the DSLR. While there will always be a niche for film-based photography, the speed and convenience of digital is such that most professionals have now migrated to DSLRs. But SLR as a form factor isn’t necessary in the digital world. SLR worked for film, but there were disadvantages; the cameras were bulky and often heavy. Heavy could be a benefit in the film world, because it helped with “image stabilisation”. But there wasn’t much that could be done about the bulk. The bulkiness was there to support the 35mm film because 35mm film was the most popular high quality format. But because digital now rivals film for quality and to achieve this quality digital doesn’t need to support 35mm film, it also doesn’t have to support the SLR form factor. And for me, SLRs were never aesthetically pleasing devices. Digital frees up the designers to produce high quality cameras that produce high quality results in different form factors. Witness the remarkable Sony NEX 5 which seems to be all lens and no body. It also has interchangeable lenses but has dispensed with the cumbersome SLR format. 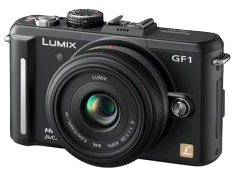 Another camera that sets the pulse racing is the Lumix GF1. Once again digital has shrunk the body size and allowed a new format of Micro 4/3 interchangeable lenses to provide the photographer with similar and familiar choices that traditional DSLRs offered the professional photographer, but without the bulk of the SLR form factor. The Olympus Pen was a classic “viewfinder” camera that was introduced in 1959 and which had a massive impact on the camera market. 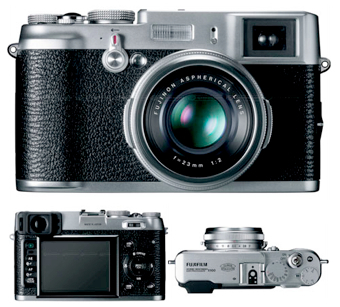 Olympus have taken this classic design icon and digitised it. Once again digital allows product designers to be much more flexible and creative in their product design, freeing them from the constraints of the conventional and creating new dynamic and exciting markets. 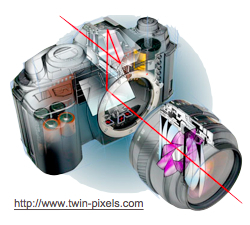 The camera pictured in this blog’s masthead is the Fujifilm Finepix X100 due to be launched “early 2011”. It is to my eye a stunning design and represents the pinnacle of this class of compact professional camera alternative, albeit without interchangeable lenses, for now at least. Good product management practice recognises future product features and plans release of these features over time. I suspect Mk2 of this camera will sport a variety of interchangeable lenses. All well and good so far but there is more revolution in an adjacent market: the camcorder market. Throwing depth of field has always been an bit of an issue for camcorders and even spending £3000 doesn’t get you interchangeable lenses. But a feature of all these digital “still image” cameras is they record video. HD Video. For a few hundred quid. You might argue that the form factor of a still image camera doesn’t match the needs of a videographer. But then as we’ve seen, form factors can be changed by innovation.